Fantastic Beasts and Where to Find Them is the latest installment in J.K. Rowling’s Wizarding World. 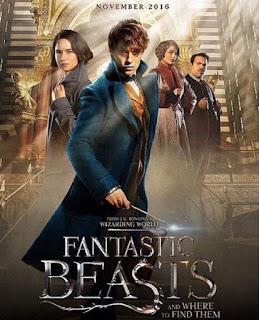 Written and produced by her, it follows Newt Scamander (author of the textbook of the same name) as he travels to New York City in the 1920s with a case full of magical creatures. In America, like in Britain, wizards are in hiding under the Statute of Secrecy, but here they fear persecution from groups like the Second Salemers, who believe witches should be burned or flogged. Magical beasts are banned in NYC but when Newt arrives something magical is already terrorizing the city. As you can imagine, bringing a suitcase full of magical creatures into a big city could be a recipe for disaster and as expected, some of the creatures escape. The character development in the film is quite good, for the main characters at least. I think credit in this right goes equally to Rowling and the actors who play these characters. Eddie Redmayne in particular is wonderful as Newt Scamander. He is humble and funny and caring, and fierce when he needs to be. Queenie is my second favorite, and she fits into Rowling’s m.o. of having ‘beautiful’ female characters be more complex than traditional media usually allow. All that said, there is a certain magic missing from the film. The sense of wonder and awe is just not the same with the Harry Potter series, and I think a lot of that is due to the fact that this is a story told only through film. I read (and listen to) the Harry Potter series very frequently and that sense of wonder and magic is always there, no matter if it’s the first or hundredth iteration. Rowling's writing in Harry Potter proper is so charming and much care is given to minutia. A lot of that is lost in this film translation. For example, there are a few glaring continuity issues. Newt spends the first quarter of the film trying to catch a niffler, which is cute and fun and all, but he could have easily caught it in three seconds with a summoning charm. And also, I’m pretty sure you need to have a wand to apparate, even side-along, and I can't believe that it’s possible to apparate with a muggle. The overall story is also quite contrived. That’s not to say that the Harry Potter series didn’t follow known story telling tropes, but Fantastic Beasts is highly predictable throughout and the climax and resolution feel like an afterthought. There is one thing though that really makes you appreciate film as the medium for this story, and that is Newt's case. I was a bit disgruntled up to this point, missing the magic and feeling a bit bored by the story, despite Redmayne’s stellar performance, but then we get to see inside Newt’s case. The case reminds me a lot of Hermione’s purse, and Newt reminds me a lot of Hagrid, and there is an erumpent, which makes me think longingly of Luna and her father and that all makes my heart smile. But I miss reading about the wizarding world in book format. I just do. While there are some writers and filmmakers who can bring that wonder and hidden detail alive in film, Fantastic Beasts just isn't there. I’m sure there are hidden treasures to be discovered upon multiple viewings, but the problem is, I have no desire to see this film again. While it was entertaining for sure, nothing about it grabbed ahold of me or left me wanting more.